Director of Community Preservation coalition told Vineyard audience that the Island is leading the way for an regional approach. The Vineyard has led the way when it comes to taking a regional approach on Community Preservation Act spending. That was the message from Stuart Saginor, executive director of the Community Preservation Coalition, when officials and residents gathered in Oak Bluffs on Tuesday to brainstorm ways for the six Island towns to more effectively share state funding for capital projects. “It’s really happened nowhere else with such speed and such terrific results as here on the Vineyard,” Mr. Saginor said. Most of the people who attended are members of the Island’s community preservation committees, which are responsible for allocating funds distributed by the state’s Community Preservation Act. Towns that have adopted the CPA agree to contribute up to a three per cent surcharge on local property tax bills. 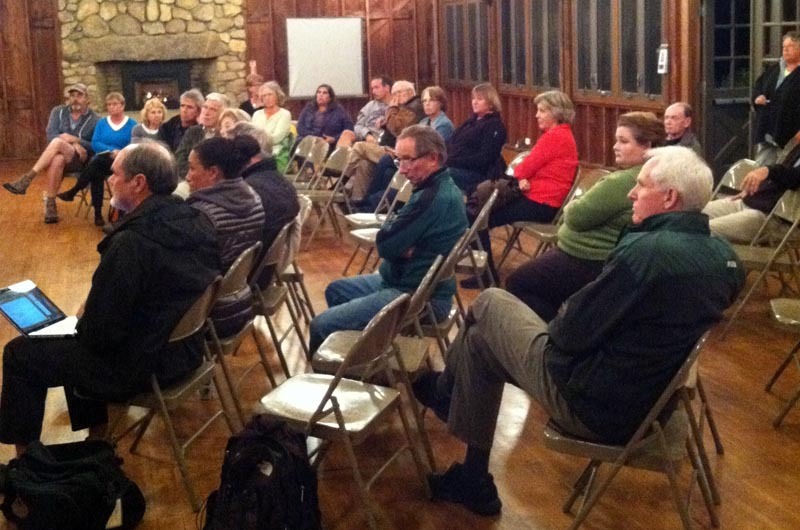 People kept their sweaters and jackets on during the two-hour meeting, which took place in the large, rustic hall at Sailing Camp Park. A small fire burned in a stone fireplace at one end of the room. Mr. Saginor opened the meeting with a presentation on the CPA, which provides funding that can be used to promote open space, historic preservation, outdoor recreation and affordable housing. The coalition works to help communities around the state adopt the CPA. Mr. Saginor said the new requirement has kindled a debate over how to fulfill the regional aspect of the CPA. he said. The panel was joined by Island Housing Trust director Philippe Jordi, Aquinnah CPC chairman Derrill Bazzy, Aquinnah town administrator Adam Wilson and state Rep. Timothy Madden. There were comments from each panelist, followed by questions and discussion from the general group. Mr. Madden pointed out that more than $26 million in CPA funds have gone to Vineyard towns, and he praised the projects that have been completed so far. The Vineyard received $3 million in CPA funds last year. All six towns last year voted to contribute CPC funds to the relocation and renovation of the Gay Head Light. Mr. Wilson said those funds helped keep up the momentum after the first summer of fundraising. “It was the groundswell of that support that has really made the second summer season even more successful,” he said. Mr. Jordi said the work of the Island Housing Trust is also indebted to the program. He said over the past eight years, the trust has created 30 home ownership opportunities and nine rental units, providing stable, year-round housing for a wide swath of the Island community, including 60 school-age children. He said the trust’s efforts to increase year-round rental and affordable housing opportunities on the Island, in line with state and regional goals, was part of a long-term vision for the community, especially in regard to the aging population. Much of the discussion focused on issues related to apportioning funds, the potential application process and how individual towns can best coordinate for regional funding. Rather than coming to any final conclusions, the meeting was mainly a chance for ideas and concerns to emerge. Jevon Rego, vice-chairman of the Oak Bluffs CPC, suggested that all six towns use one regional application. He said that issue came up at an earlier gathering of the Island CPCs last year, but was never quite resolved. The earlier group had also looked at how funds should be divided among the towns. Mr. Bazzy said the CPA budgets for each town corresponded with what he called a 50/50 formula, where regional assessments are made according to population as well as real estate value, with each having equal weight. He said the Islandwide CPC group will likely meet again this year to come up with “a more consistent approach” to the requirements. Donna Hayes of Oak Bluffs was concerned that larger regional projects might take precedence over smaller projects. “There should be some limit of the funds in each town that’s for regional purview,” she said.